SQW was commissioned as lead consultant to undertake a review of the strategic direction, business model, financial viability and management structure of HKPC. The HKPC employed 600 staff, and had for over 25 years played a key role in enhancing the productivity of Hong Kong industry and encouraging technology upgrading and innovation. But its traditional role had been challenged by the movement of most manufacturing activities into mainland China and the establishment of other organisations in Hong Kong. A radical rethink of future role and structure was therefore required. SQW was commissioned to work with Scott Wilson Hong Kong to make inputs to a detailed submission of proposals for development of land related to a new port at Nansha in the Pearl River Delta, China. The land area concerned is around 26 sq km, to include port related activities and more general urbanisation. Our role was to advise on the nature and scale of provision for industry and service activities, both port related and others suited to this location. 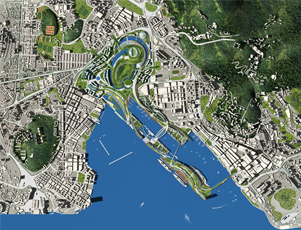 We were commissioned to undertake the feasibility and planning studies for Hong Kong Science Park. The first stage involved: a major survey of firms in Hong Kong and overseas to establish market interest; reviews of economic change in Hong Kong and the surrounding region, and of investment trends in R&D and other technology based activities; and an assessment of the effectiveness of the current technology infrastructure in Hong Kong, and the additional benefits a science park could provide. We undertook a full feasibility study for an innovation centre to support the formation and growth of new innovative and technology based businesses in Hong Kong. This included market analysis, proposals for physical development and organisation and management arrangements. We later advised on the appointment of the first Chief Executive. The Centre was subsequently built and has proved extremely successful. The main objective of the project was to prepare a concept plan as the first stage of a full feasibility and business planning study for a 6 sq km area of Guangzhou which is to be developed as a science district. The aim is to propose for a smart integrated land transport system. The Smart Land Transport system will provide a nationwide quality, rapid, efficient and safe transport service network that can ensure sustainable, equitable and uncongested mobility and connectivity in livable cities to support the long term 2035 development goals. We were commissioned by the Government of Brunei to undertake a feasibility study of an Agro Technology Park. The Park will help diversify the country's economic base. It will have three main roles: a location for agricultural/horticultural research and its commercialisation; a physical location for development of the Brunei Halal brand – involving the importation, testing, certification to Halal standards, packaging, branding and re-export of foodstuffs, pharmaceuticals, cosmetics, etc; and the development and production of products based on the natural flora of Brunei. We were asked by World Bank to assess the impact of current industrial policies on de-concentration of industry from the major conurbations on Java and development of other regions of Indonesia. We focused particularly on the role of industrial estates, export processing zones and similar policy instruments, and made recommendations to increase their impact on regional development.